Each day hundreds of vendors and contractors come onto campus to provide services to the university. PTS recognized that vendors and contractors are a critical facet of campus life. However, the university has limited parking facilities to satisfy the parking demand of these visitors and the normal number of staff, faculty, and students. Therefore, it is essential the university have clear and concise policies and procedures to accommodate the vendors and contractors who have business on campus. Vendors or contractors who perform services to university facilities in easily recognizable “branded / logo” vehicles. Because these companies have a service arrangement with the university, it is assumed that the volume or special discount that the university enjoys includes provisions to provide parking and access to the university. This access provision should be addressed in all future agreements and or contracts by university supervising departments, purchasing, or the contracting agency. The cost of a V Permit will be included in the university contract. The sponsoring university entity will ensure the university's interest are protected during contract negotiations. PTS must be informed of any contractual commitment concerning parking or access. No permits will be issued. No additional cost will be charged for access or parking on campus. University surface lots for no longer than 30 minutes with emergency flashers. Vendors and contractors who have service contracts with the university and conduct their business in unmarked vehicles. These types of vendors or contractors are supervised by the university's departments or agencies such as Facilities Services, Housing and Food Services, Telecommunications, Athletics, and Environmental Health and Safety, and others. The university's supervising department must coordinate their parking needs with PTS. Several options area available to accommodate these vendors and contractors. The first option is for the vendor to purchase a Class V Permit for one or all of the company's authorized vehicles. If there are multiple vehicles the company must coordinate with PTS to determine the number of permits and the process to identify the vehicles. The cost of purchasing a permit will be the annual, monthly, or daily equivalent of the cost of the Class F Permit. Currently that would be $554 per year for each permit. The cost of a daily permit will be $11. In areas approved by PTS. All university surface lots for not longer than 30 minutes with emergency flashers. In an area coordinated between the university department and PTS. The third type is a vendor or service provider who has no contractual relationship with The University of Texas at Austin and conducts business from unmarked vehicles. Consultants and salespersons usually fit this category. These individuals will not be provided free access to the campus. They will be referred to one of the university parking garages or to PTS to purchase an annual (“V” Permit), monthly, weekly, or daily parking permit at the existing rate. If a sponsoring department or agency wishes to pay for this vendor parking, the department must coordinate with PTS. If special parking locations are needed other than a university garage, it must be coordinated with PTS. Contract Vendors — PTS must be informed of any contractual commitment concerning vehicle parking or access. The vendor or university department coordinating the V permit is required to provide payment for the permit, and the cost of parking will be included in the university contract. The sponsoring university entity will ensure the university's interests are protected during contract negotiations. Daily Vendors — Salespersons, consultants, or other commercial agencies that are not university sponsored vendors will be referred to one of the university parking garages; or if special parking locations are needed other than a university garage they must coordinate with PTS to purchase an annual, monthly, weekly, or daily V Permit at the current rate. Logo Vendors — Vendors who service the campus in easily recognizable brand/logo vehicles will not be required to display a permit. Members of the Press — Members of the press as identified by the Office of Public affairs. V-Press permit holders receive an additional dashboard permit that designates them as members of the press. V Press permits are additionally valid in UT Vehicle spaces. NOTE: It is the responsibility of the sponsoring university department or agency to make the determination as to the type of services being provided to the university and to notify PTS in writing. The Parking Perks is a low-cost parking alternative offered to approved UT affiliates for access to park in designated university parking garages. Written approval is required prior to purchase. For approval, please e-mail garages@utexas.edu. Purchases can be made at any university parking garage office during normal business hours. Initial purchase is $20 minimum (no service fees-this is $20 worth of use in the garages). After the initial purchase, the card may be re-charged any amount, $20 or greater. Recharge the card at any university garage office. The card has no expiration date. A set fee will be deducted from the card balance for each use. Card usage fees are subject to change. Currently, each time the card is used at a garage, $12 will be deducted from your card. The regular daily rate for garage parking is a maximum of $18 per entry, so the debit card offers the opportunity for substantial discounts. 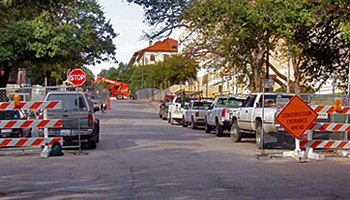 *Contractor parking is only offered in Manor Garage (MAG), Trinity Garage (TRG), and Guadalupe Garage (GUG). The access card in non-refundable, and Parking and Transportation Services will only recharge a replacement card for any unused amount at the time the original access card is reported lost, damaged or stolen. A $10 replacement fee will be charged for any access card that is lost or determined damaged by user negligence. If you have additional questions about the UT Share Pass, please e-mail us at garages@utexas.edu. For contracts that are currently in existence: PTS will honor existing agreements until they expire. The intent is to prevent new agreements with the vendors and/or service providers from providing free parking on The University of Texas at Austin campus. PTS will work with the University departments to provide current access. The supervising department will identify the vendor and/or contractor access and parking requirements. PTS will issue with temporary permits or daily scratch off permits. Exact parking areas will be coordinated with PTS and the department. If the current contract precludes the vendor from purchasing the parking, it will be provided by PTS.